This has to have been one of my most enjoyable commissions to do in awhile. The Black Templars have always fascinated me and I really like their color scheme. 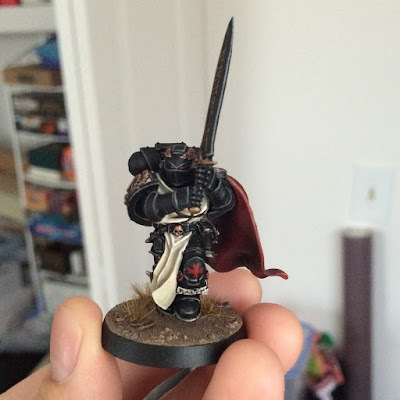 I had already painted a mostly black and white marine army though with my Sons of Dorn, so I had never really wanted to take the dive again. Now with this commission I got to scratch that itch and give the Templars a try. 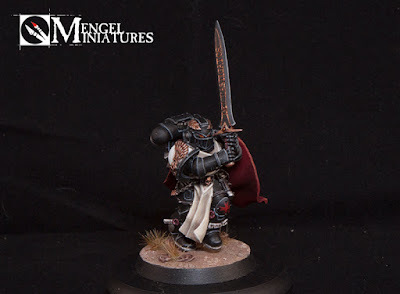 There was quite a bit of extensive conversion work put into this model, which you can see in my first article on him. 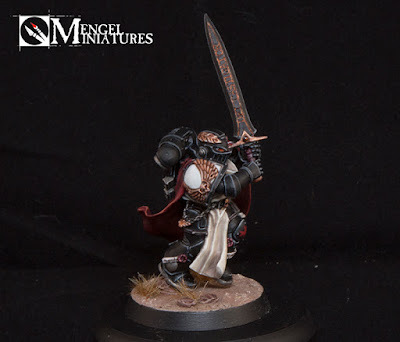 To quickly summarize what I converted though, it was a scratch sculpted tabard, cloak, and laurels as well as a head, sword, and shoulder pad swap. Painting him was pretty straight forward. The client and I discussed it a bit and decided on sticking to a pretty basic Templar color scheme. 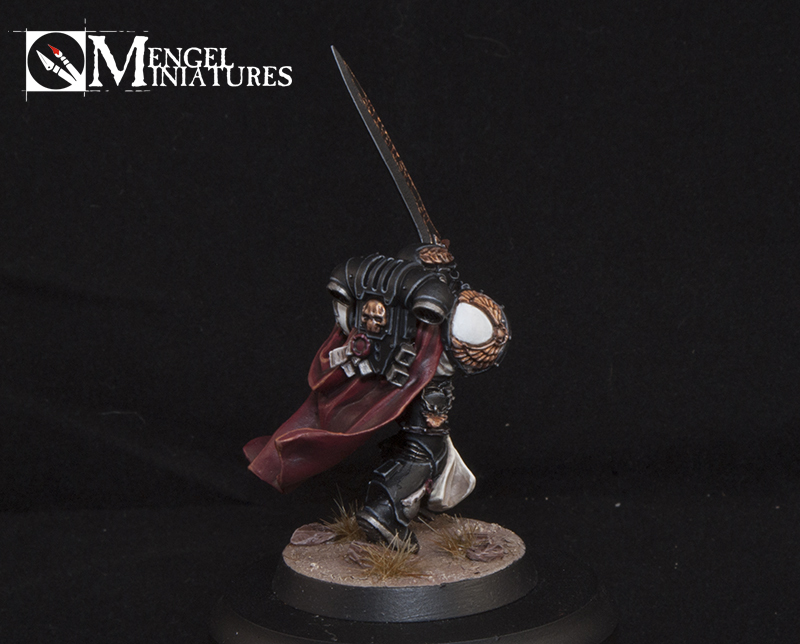 The black was simply a basecoat of black with three layers of highlights. I used Eshin Grey, Dawnstone Grey and Administratum Grey in progressively smaller and finer layers. The trick is just to keep the highlights as thin as you can. Luckily, if you mess up it's pretty easy to correct it with black. 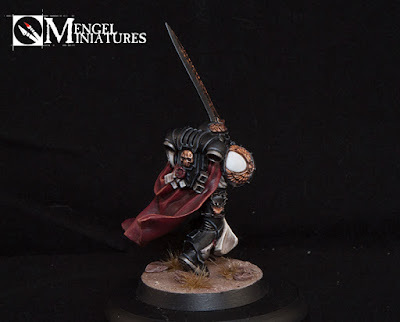 The cloak was probably the most fun part to paint. It was a basecoat of Khorne Red, which I then shaded with several layers by mixing in black. There wasn't really any strict order I did it in. I just did several very thin layers in the folds and built it up until it was at a point I was happy with. This also required going back with just Khorne Red in areas to smooth out the transition. The highlights were done by mixing in Tau Light Ochre and painting on very thin lines. I built this up over maybe three or four layers. The white on the shoulder pads had an initial basecoat of Rakarth Flesh just to act as something light to paint the off white onto. The next layer was a solid coat of Ulthuan Grey which was highlighted with pure white. The shading in the lines was done with Agrax Earthshade. The gold was done in my normal method with Balthasar Gold, Gehenna's Gold, Runefang Steel and Agrax Earthshade. The tabard was painted with Rakarth Flesh before getting a solid coat of Ushabti Bone. 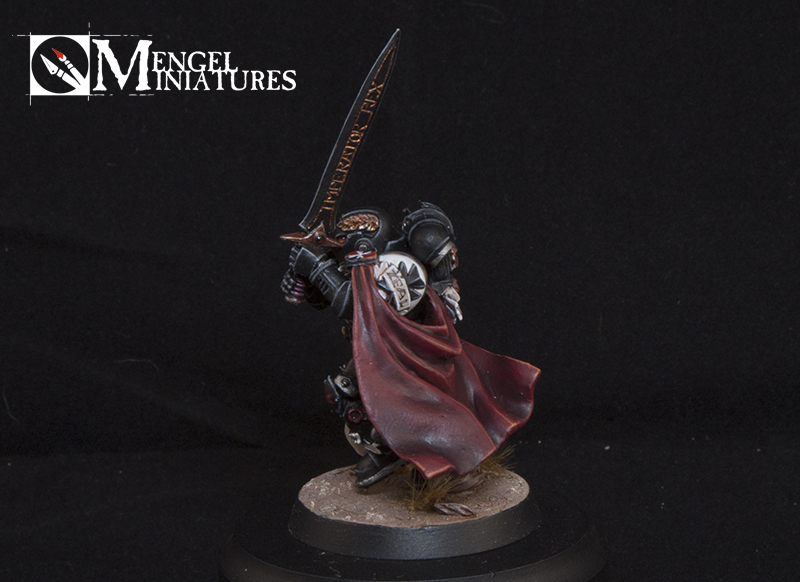 This was shaded with a mix of Ushabti Bone and Agrax Earthshade. It was highlighted with several layers of Ushabti Bone mixed with progressively more white. 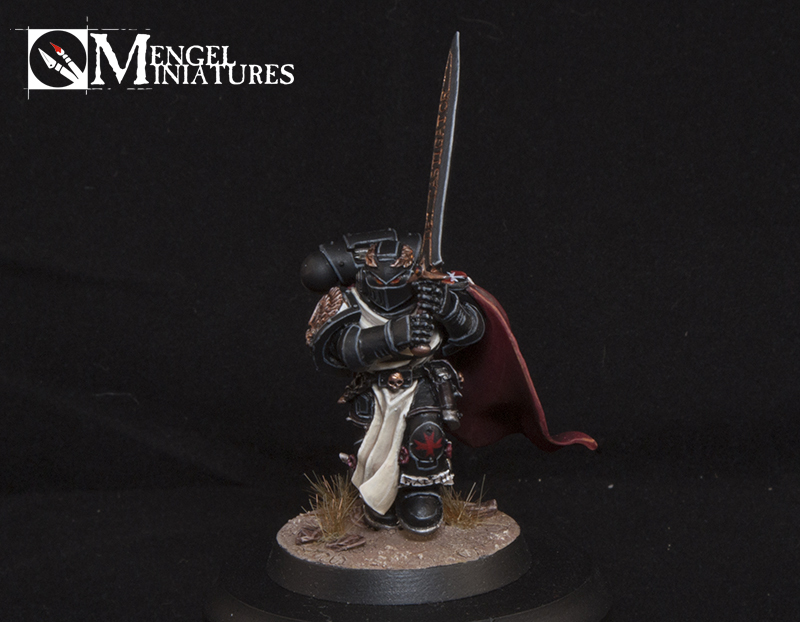 I decided to paint a few extra details on the model such as a Templar cross on his chest and a red one on his knee. 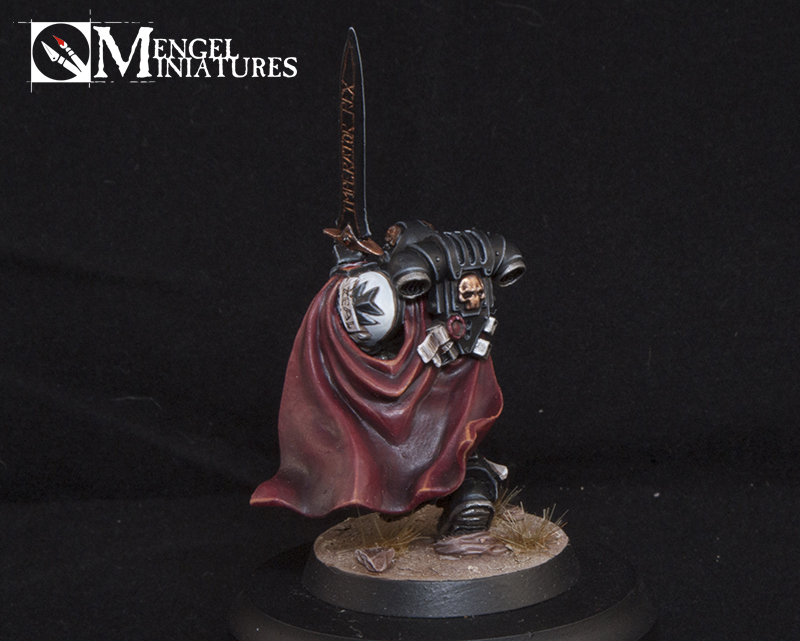 I painted the word "Faith" on the scroll on his knee and "Zeal" on the one on his shoulder pad. You can see the cross on his chest better in this picture, I apparently missed it in my professional pictures and the model has already gone to the client at this point, so no chance for a re-shoot. However, you can check out a 360 degree view of the mini in the video below. The music is once again provided by Adam Harvey, you can follow him on his Facebook page and listen to some more of his music on his Youtube channel. Enjoy! This same client has several more Black Templar character commissions lined up for me in the future, so expect more of out zealous brethren on this site. As always, be sure to vote for him on Cool Mini or Not here. Remember, I do take commissions (like this model I'm showing off! ), so if your interested you can contact me at tylerm@mengelminiatures.com. You can get an idea of my pricing with my pricing guide up near the top of my site, but every project is different, so contact me for a concrete quote on what ever you are thinking of getting done.